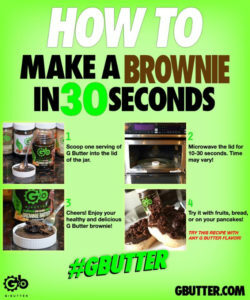 G Butter is a high protein, low calorie nut butter that can be used just like peanut or almond butter on bread, bananas, celery, or other foods, it can be spread on any baked good as a frosting, enjoyed straight out of the jar, and amazingly can be microwaved into a brownie in just 30 seconds! I have found the G Butters to be very satisfying to eat. They really manage the sweet tooth for me! They are convenient and easy. Brownie Batter reminds me of a childhood memory but it's so much healthier. We would get Jif brownie mix that came in a small box, add an egg and eat it straight from the box. Definitely delicious but not healthy. 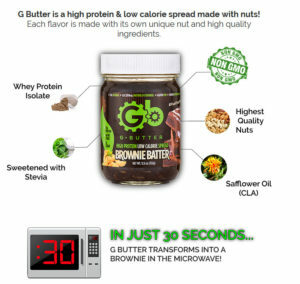 With G Butter I can relive the memory but know that I am getting a healthy snack which satisfies my sweet tooth. I put a little on a plate, microwave and enjoy! It's a treat I am not sharing with my family because once they try it, I know it won't be there when I want some. Let them eat cake while I munch on some G Butter. I generally pop my serving into the microwave and enjoy a cakey treat. I have eaten this as part of breakfast (Cinnamon Bun) as an afternoon or evening snack. My favorite by far has been Brownie Batter but I am looking forward to trying Sugar Cookie. I love Brownie Batter G Butter. It is a perfect quick (and I mean quick) "I forgot to plan" breakfast or snack! Hot out of the microwave with a bit of fruit is my favorite way to eat it. I shared it with some co-workers and they immediately ordered some! It's delicious, decadent and rich without the guilt! Really hits that chocolate craving with real chocolate! If chocolate is your weakness this is definitely a product to try! I haven't tried any other flavors yet but it they are as good as the brownie they won't last long in my house either! I'm a big fan of the Cookie Dough! It's a creamy consistency with chocolate chips, and little pieces of almond in every bite. My favorite way to eat it is to put it in a small ramekin and heat it in the microwave. It tastes like a warm cookie dessert with a cake-like texture...so yummy. This has definitely been my go-to when I have that afternoon or late night craving for something sweet. I really like the Cocoa Hazelnut! It has the consistency of brownie batter and tastes like it too. I use it like I would use peanut butter on a piece of toasted bread. It is a great mid-morning snack at work to get me through the morning and give me a boost. I just leave the jar in our break room refrigerator and leave the bread there too. I let my co-workers try it because they were curious and surprised that it was actually good for you. It is sweet, but not grossly sweet so I have it with coffee, and no guilt! My favorite G Butters are Brownie Batter and Sugar Cookie. I have eaten them straight off of a spoon, dipped an apple in them, and spread them on rice cakes. All three ways are delicious! My favorite G Butter flavor is Cinnamon Bun but I also like Cookie Dough. I have been eating them straight out of the jar. However, this morning I spread some Cinnamon Bun on a rice cake for breakfast. Delicious! I had Sugar Cookie for breakfast - LOVE IT - even as much as Brownie Batter! I will choose my flavor each day depending on if I am in the mood for chocolate or not. I prefer both as cookies over eating them as spreads straight out of the jar. When I first tried the Brownie Batter, I microwaved it and loved the brownie that it made! Then the next day I spread a thin layer of Brownie Batter between tea biscuits and made my own healthy sandwich cookies. Delicious! I tried the Brownie Batter and wow!!! I just stirred it and ate a tablespoon of it! It tasted like I was eating uncooked brownie batter!!! And I love licking the utensil when I mix regular brownie mix - almost more than eating the brownies after they are cooked. I tried the G Butter microwaved too!! Still awesome. I could eat it either way! Peanut Butter Cup G butter is yummy - the only way I tried it was by the spoon out of the jar! I just need to figure out how to just eat a serving size instead of a quarter of the jar at one sitting. I’ve eaten the Brownie Batter and Peanut Butter Cup G Butters straight out of the jar, and also microwaved into cookies. One word describes them – Delicious! I have been a fan of G Butter for a few months now. While I usually eat a small bowl of it after heating it up in the microwave, the satisfactory taste of eating the remains on the spoon always tastes just as good. My favorite flavor is Chocolate Brownie, but I also enjoy Birthday Cake as well. I love the G Butter Brownie Batter! I scoop a little peanut butter in a small bowl and then scoop the Brownie Batter on top. I microwave it for about 30 seconds and it becomes a warm peanut butter chocolate brownie. I would definitely recommend others to try it! My 18 year old athlete son can't get enough of Brownie Batter G Butter. He has it almost every morning as part of his breakfast, and sometimes as an after-practice snack. I don't dare take any of the Brownie Batter - it's his! The Cookie Dough G Butter is super yummy! This is the G Butter we share. Sometimes we do half-n-half with another variety. It is the all purpose G Butter. Birthday Cake is my favorite. It's freakin' good! And the Sugar Cookie is pretty darn yummy. Both my son and I eat all of these flavors by spooning them into a shallow dish and microwaving it for 45 seconds. This gives you a nice fluffy brownie. We think G Butter is very tasty and very filling. When I eat it, it is my breakfast - along with a glass of milk....G Butter is far and away our favorite! My son and I just tried a brownie made out of the G Butter Brownie Batter tonight. It was super delicious! The G Butter Brownie Batter is my favorite so far. I've been microwaving it and putting just a little peanut butter on top. It's hard to believe it's actually good for you! I've been looking for an alternative to get my kids away from junk sweets and I think this is the answer. They love the Brownie Batter and Sugar Cookie too! White Chocolate GButter is the bomb!!! Best flavor yet and not too sweet! I tried White Chocolate and I love it. It reminds me of the inside of a 3 Musketeers bar crossed with a jar of marshmallow fluff. I tried the White Chocolate G Butter cold straight out of the jar from the refrigerator as well as heated in the microwave. Both were very good, but I loved it right out of the microwave. It tasted like a warm white chocolate cake...so yummy!